Award Ceremonies are a fantastic time for celebration as this is when people are given the recognition they deserve for fantastic skills, performances and talents. The entertainment has to match this joyful mood, providing a spectacle worthy of the people that are receiving their awards. In the ten years that we’ve been operating. 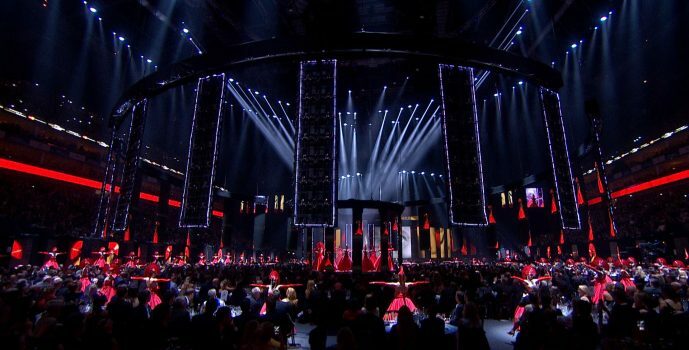 Accelerate has had the fantastic honour of working with some huge stars at high-profile award ceremonies such as Mobo Awards and The Brit Awards. Whether your event is going to be plastered all over the TV or smaller and more discreet, we will have the entertainment and expertise to take it to the next level. Our entertainment services for award ceremonies range from providing event staffing or backing dancers, to choreographing entire shows. At the Mobo Awards our creative director Kwame Knight choreographed a performance that saw the Roll Deep crew air lifted into the ceremony. In 2013 Kwame was commissioned to direct double award-winner Emile Sande’s medley performance at the Brit Awards where he provided choreography to match the sophisticated style of the music. We have also delivered highly talented, choreographed backing dancers to support a Brit Awards performance from Cheryl Cole. Choreography and backing dancers are certainly two of the most popular entertainment services that we provide for award ceremonies, although ultimately we are happy to source any type of entertainment that you require. From the Award Ceremonies to the after parties: we also work with a range of fantastic DJs and musicians who can bring energy and flair to any partying that goes down after the award ceremonies themselves are over. Make sure that your guests’ night is memorable from start to finish by booking the top quality entertainers who have years of experience and know how to give audiences exactly what they want. All of our artists and DJs are professional, energetic and ready to tailor their performances to fit any themes or requests that you have. We love working at award ceremonies because they are just so diverse and full of life! Whether you need creative direction for a specific performance, event staff such as greeters to help ensure the smooth running of the show, general entertainment for the partying that goes alongside the award ceremonies or just about anything else, we will be able to provide it for you. Accelerate takes all the hassle out of event entertainment and this includes our booking process: just call or connect with us online to discuss your needs in detail with one of our attentive and experienced members of staff.